There's still time to get away this summer! In the Northern Hemisphere there are still weeks until Autumn officially begins. But what to do when you really want to escape (without leaving home)? How about hitting a little Science-Fiction or Fantasy? "More than 5,000 of you nominated. More than 60,000 of you voted. And now the results are in. 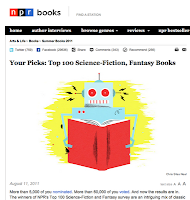 The winners of NPR's Top 100 Science-Fiction and Fantasy survey are an intriguing mix of classic and contemporary titles. " Read NPR's list of Top Science Fiction/Fantasy Books. So this week we want to know what are your favorites? If you need a little fantasy, a little sci-fi get away --what books are your picks? Check out the list and tell us some of your own. Please use this format for your comment: Book Title, Author and why you choose it for the Get Away Challenge. This is going to take us some time --we are working on our LISTS of favorite Fantasy/Sci-Fi... it is a rainy day, so it's PERFECT! We'll post SOON! this book sucked me in after the first line ''it was my aunt who decided to give me to the dragon'' and by the second chapter i wasn't a girl reading a book i had become the omniscient voice and i had become a part of the book. if you like heroines, following your dream, stubborn characters, dragons, and a bit of fighting. this is the book for you. Try Steampunk Paranormal Romance Author Gail Carriger--Parasol Protectorate series for a rollicking good Victorian-era time, with steam powered airships, aethergraphers (telegraphs) and glassicals, vampires, werewolves, ghosts, tea and parasols--and a heroine who isn't rail thin, a karate expert and loves a good nosh! The Company series by Kage Baker is also excellent. Set in the future, the Company sends androids--who were once people in the past--back in time to "restore" i.e. steal things to their present our distant future. My final author to mention is Louise Marley, who is a classical musician and author, truly takes the definition of science fiction to heart: Taking a social or scientific fact to its logical conclusion. I highly recommend the Glass Harmonica, Terrorists of Irustan, and The Maquis, as well as any of her short stories. These books were printed in short runs and are difficult to find, but may likely be found at your library. How about Diane Duane's, So you want to be a wizard series? Okay, maybe not as complex as some of the other worlds listed in NPR's list but you can't put most of them down. My first instinct was to list for myself all the ones on the NPR list that I've already read and are favorites. I need to get that out of the way before I can comment. Then I'll probably use things from the list to say why. So I'll get back to you. For fantasy fans everywhere, I can't praise the biting guidebook by Diana Wynne Jones "A Tough Guide to Fantasyland". It's hilarious and catagorizes everything from settings to characters to objects that one tends to find turning up all too frequently in fantasy fiction. I adore everything written by Terry Pratchett (no secret there). Rather surprised no one included Octavia Butler's "Kindred"-a time travel/historical fiction book that was much more philosophical than "The Time Traveler's Wife". Hmm, it's interesting that NPR listed Asimov's Caves of Steel, but not the rest of the robot series. I really love The Naked Sun, Robots of Dawn and Robots and Empire just as much as Caves of Steel. I've also really been enjoying Bradbury's October Country, which is a fun easy to ready short story collection that's a little bit scary, too! I agree, Kindred is an amazing story. And quite good, but you really have to be very open to the premise and racism that existed in the time the protagonist travels to--and our own. A note on Ray Bradbury--he turned 91 just this week, and still writing strong. An amazing visionary talent, I have never once read anything by him that did not make me think, feel, and DREAM. Anything by Robin McKinley, Peter Dickinson, Tamara Pierce, Garth Nix, Kevin Crossley Holland, Gail Carson Levine. The writing nourishes as well as engages me with each of these authors. McKinley, especially. "Hitchhikers Guide to the Galaxy" by Douglas Adams- It's hilarious! "Poison Study," "Magic Study," "Fire Study," "Storm Glass," "Sea Glass," and "Spy Glass" by Maria V. Snyder- Stong female characters, an imaginative and complex world, magic, and great love story. "The Hunger Games" by Suzanne Collins- Strong female lead, fast paced, and exciting take on a post-apocalyptic world. "Uglies," "Pretties," and "Specials" by Scott Westerfeld- Another fascinating look at a post-apocalyptic world, a great take on the importance of beauty, knowledge, conformity, and independence in any world. it is like stepping in to another world, you are in the abby sipping tea with the abby beasts, or maybe fighting vermin. the animals have great personalities, the hares are wild have the biggest appetite and great humor, the mice have a loving hart and most of them love adventure, the squirrels are hyper, fun, and loving, the badgers are the biggest of them all, they are loving, fierce, and a bit scary. i think people of all ages will love this but it can be too much for young kids under 7 or 8 years. there are 17 books in red wall, and i think you will love them all!!!! !